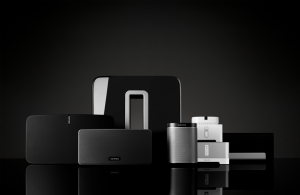 Sonos is a smart system of HiFi wireless speakers and audio components. It unites your digital music collection in one app that you control from any device. You can access your personal music library, favorite streaming music services, and over 100,000 internet radio stations from around the world. The Sonos app lets you find, play, control and explore your music, your way. Take total control of your home listening experience with the Sonos app. Play, control and explore your music, your way. Press two buttons and begin your listening experience using one powerful app to access your music with a modular system that can expand to other rooms in your home.